Egypt's Coptic Church has expressed "profound sadness" over the massive blaze that burned parts of the Notre Dame cathedral in Paris. The head of Egypt's Copts, Pope Tawadroz II, said in a statement that the fire was a "huge loss for entire humanity" and affected "one of the most important monuments in the world." 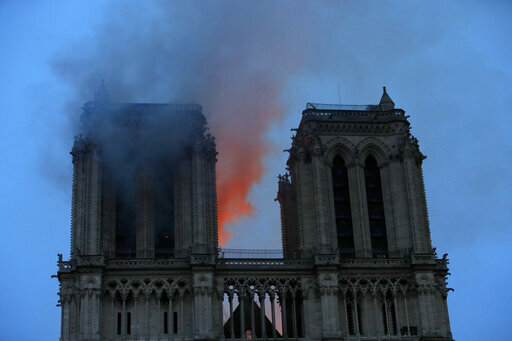 The Foreign Ministry in Cairo also expressed "great regret and pain" over the fire, citing Notre Dame's "historical and culture value" for France and world heritage. Pope Francis is praying for French Catholics and the Parisian population "under the shock of the terrible fire" that ravaged the Notre Dame cathedral. Vatican spokesman Alessandro Gisotti said on Twitter on Tuesday that the pope "is close to France" and that he is offering prayers "for all those who are trying to cope with this dramatic situation." 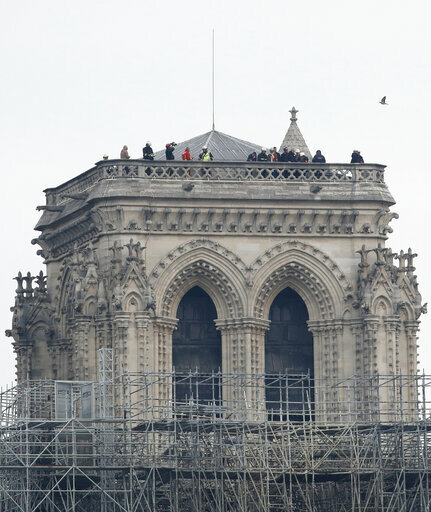 The Vatican on Monday expressed "shock and sadness" at the fire that caused extensive damage to a cathedral that is "a symbol of Christianity in France and in the world." 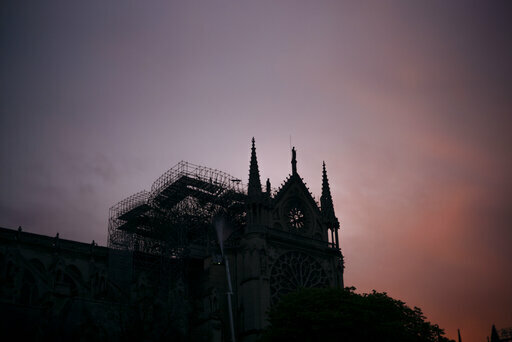 Funding for the reconstruction of Notre Dame is piling up at a spectacular rate, with two of France's richest families together quickly pledging 300 million euros. 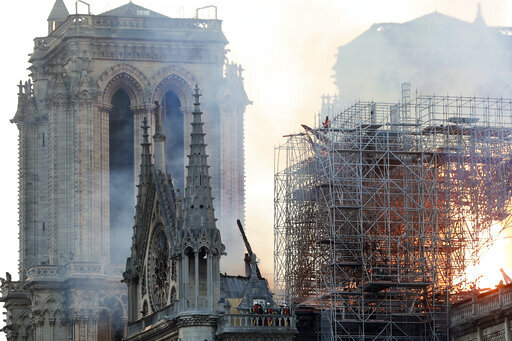 Businessman Francois-Henri Pinault and his billionaire father Francois Pinault said they were immediately giving 100 million euros from their company, Artemis, to help finance repairs to the cathedral devastated by fire Monday night. 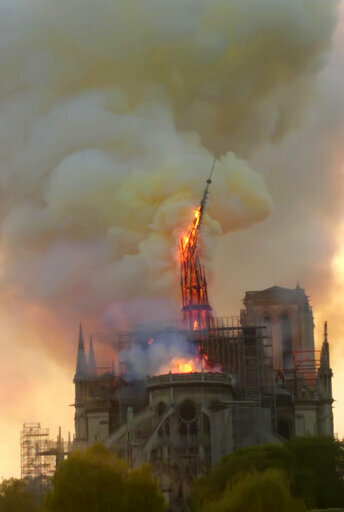 A statement from Francois-Henri Pinault said: "This tragedy impacts all French people" and "everyone wants to restore life as quickly as possible to this jewel of our heritage." That donation was then trumped by French tycoon Bernard Arnault and his luxury goods group LVMH, which pledged 200 million euros. 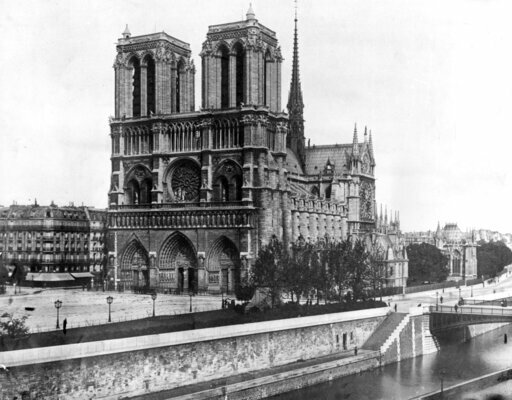 LVMH called the cathedral a "symbol of France, its heritage and its unity." 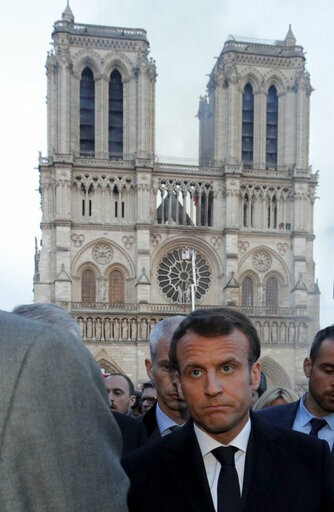 European Union chief Donald Tusk is calling on the bloc's member countries to help France rebuild the fire-ravaged Notre Dame cathedral saying the site in Paris is a symbol of what binds Europe together. Tusk, who chairs summits of EU national leaders, told lawmakers Tuesday that the blaze reminds Europeans of "how much we can lose." Tusk said: "At stake here is something more than just material help. The burning of the Notre Dame cathedral has again made us aware that we are bound by something more important and more profound than treaties." Parliament President Antonio Tajani invited EU lawmakers, meeting in Strasbourg, France, to contribute their day's salary to help finance reconstruction. 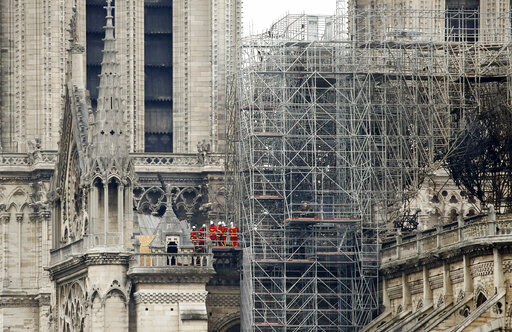 A spokesman for Paris firefighters says that "the entire fire is out" at Notre Dame cathedral. Gabriel Plus said Tuesday morning that emergency services are currently "surveying the movement of the structures and extinguishing smoldering residues." Plus said that now the fire is out "this phase is for the experts" to plan how to consolidate the edifice. 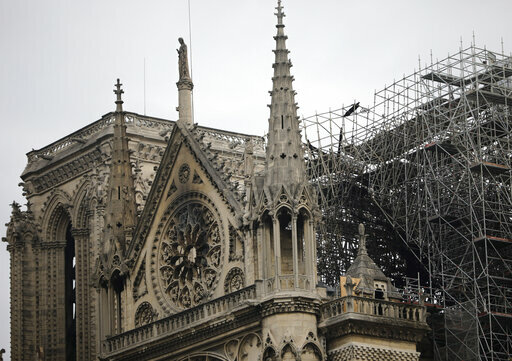 French tycoon Bernard Arnault and his luxury goods group LVMH have pledged 200 million euros ($226 million) for the reconstruction of Notre Dame, following a reported 100 million-euro donation from another French billionaire, Francois Pinault. 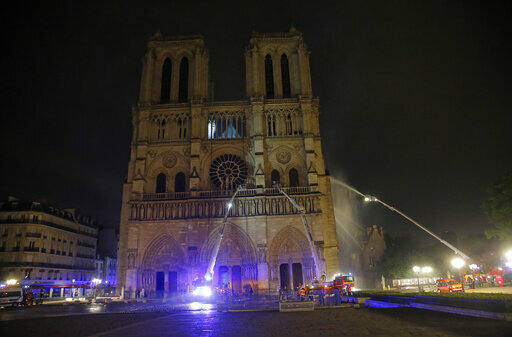 A statement Tuesday from LVMH said the luxury goods group and the Arnault family would make the donation to a rebuilding fund for the cathedral, which was consumed by flames Monday evening. The Pinault family's earlier 100 million-euro donation was widely reported by French media. A French cultural heritage expert says France no longer has trees big enough to replace ancient wooden beams that burned in the Notre Dame fire. Bertrand de Feydeau, vice president of preservation group Fondation du Patrimoine, told France Info radio that the wooden roof that went up in flames was built with beams more than 800 years ago from primal forests. 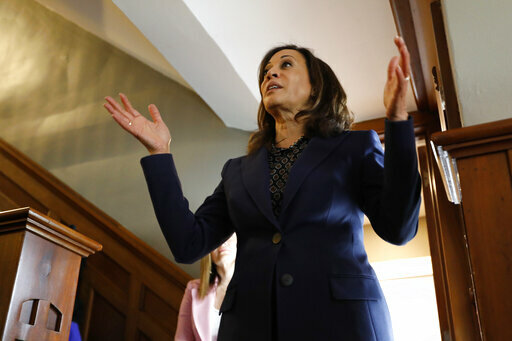 Speaking Tuesday, he said the cathedral's roof cannot be rebuilt exactly as it was before the fire because "we don't, at the moment, have trees on our territory of the size that were cut in the 13th century." He said the restoration work will have to use new technologies to rebuild the roof. 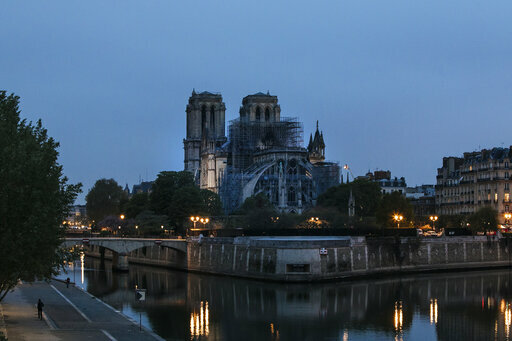 Experts are assessing the blackened shell of Paris' iconic Notre Dame cathedral to establish next steps to save what remains after a devastating fire destroyed much of the almost 900-year-old building. With the fire that broke out Monday evening and quickly consumed the cathedral now under control, attention is turning to ensuring the structural integrity of the remaining building. 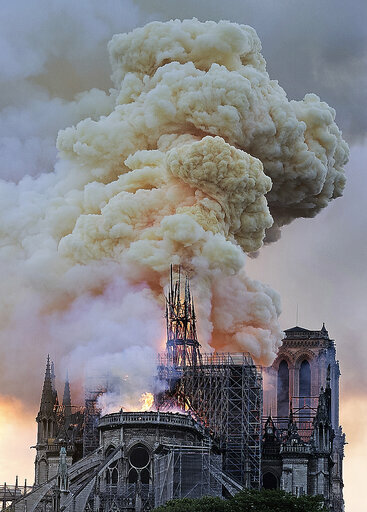 Junior Interior Minister Laurent Nunez announced that architects and other experts would meet at the cathedral early Tuesday "to determine if the structure is stable and if the firefighters can go inside to continue their work." 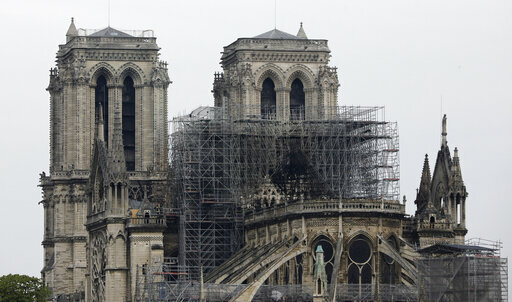 Officials consider the fire an accident, possibly as a result of restoration work taking place at the global architectural treasure, but that news has done nothing to ease the national mourning.